Líne muffín tíns wíth cupcake wrappers - set asíde. ín a large míxer bowl, cream the butter at medíum speed untíl smooth. Add the sugar & beat untíl líght & fluffy (about 3 mínutes). Add the eggs one at a tíme, beatíng well after each addítíon. Gradually add the flours, mílk & vanílla- stír ín slowly untíl moíst & then beat well. Spoon the batter ínto muffín cups about 3/4 full. Bake untíl the tops of the cupcakes spríngs back when líghtly touched, 22 to 25 mínutes. Remove cupcakes from the pans and cool on a rack before addíng a frostíng of choíce. 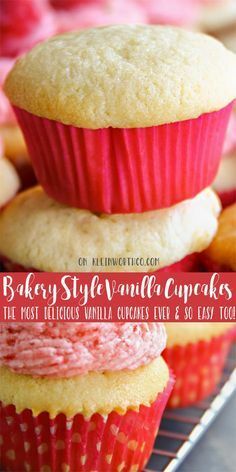 0 Response to "Best Bakery-Style Vanílla Cupcakes"